Hello Color Challenge fans! It's Jeanne this week and it's time for a new color challenge. First let's start with Mary's favorite from last week. She chose this gorgeous card "Thanks" by card crazy aka Denise. Mary said "Her vase filled with florals and stems caught my eye. I also like the technique she used to create the vase. Then her background texture was so perfect to display the lovely vase." Congrats Denise! The code to add the badge to your blog is below. We will also feature your card on our Pinterest board. See that here. Please keep in mind, too, that while we list SU colors for the challenges these are just color reference points. Use the closest colors you have. we want everyone to play!!! Please put CC734 in your keywords section (and if you have more than one challenge use a comma to separate them) so we can find your card! Last edited by UnderstandBlue; 04-09-2019 at 07:43 PM..
Great colors today! Here's my card. Lovely colors which said "sunset" to me....and I went with it. Thanks, Jeanne. Penny a great choice of colors. I got lucky as my DP has all 3 colors in it. Thanks for the colors, Jeanne! Here's mine. I did not realize my card for Teapot Tuesday had today's colors so I am adding that to my description. Happy accident. such a lovely trio of color, Jeanne. Thank you for bringing them today. This week’s colors are making me thirsty! I took a little bit of liberty with the jar & water. I’ll be back after dinner to comment on the gallery. 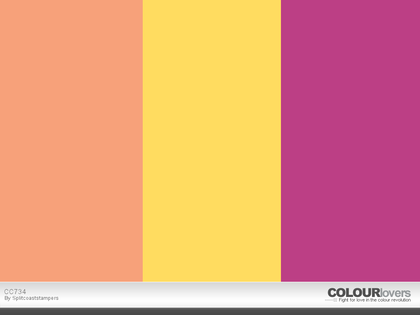 Love this week's color challenge. Thanks! This was definitely a challenge for me Jeanne. Thanks for stretching my mojo. Combined last week's colors with this week's sketch!